AFTER MOVING HALFWAY AROUND THE WORLD TO BE A ‘SOCCER MOM’, MADONNA HAS SPENT THE PAST YEAR WORKING ON HER NEW ALBUM. AS WE CAST OUR EYES FORWARD TO 2019’S MOST HOTLY-ANTICIPATED NEW POP RECORD, WE ALSO LOOK BACK AT WHY SHE REMAINS THE MOST INFLUENTIAL WOMAN IN MUSIC TODAY. 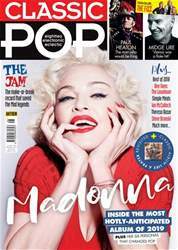 A full 35 years on from the release of her debut single, Madonna has now reached the point in her career where she is expected to churn out uninspired albums of covers, duets, orchestral reworkings or any other gimmick designed to conceal a lack of creativity. Or maybe remaster her past glories before hitting the road to trot out the hits on a seemingly endless ‘farewell tour’ (hello, Elton). That she rejects this ‘heritage act’ route to challenge herself by making fresh, current-sounding music is admirable, but not at all surprising.